One of my co-worker is a vegetarian so I always like peaking at her lunches to get ideas for things I can make. One day she had spinach linguine which I can't remember the last time I had so I went to my local grocery store and only found one box of spinach pasta, a fettuccine. Then I looked for interesting recipes to pair it with and found a non-traditional pesto that is light on oil but super high in protein! Place garlic and basil in a blender (I found this recipe too large for my food processor) and pulse a few times to get it chopped up. Add the remaining ingredients and blend until relatively smooth. Add a little more vegetable broth if it seems too stiff. Set aside until ready to use. Saute mushrooms, garlic, thyme and salt. Cover pot and cook 5 more minutes, stirring occasionally. 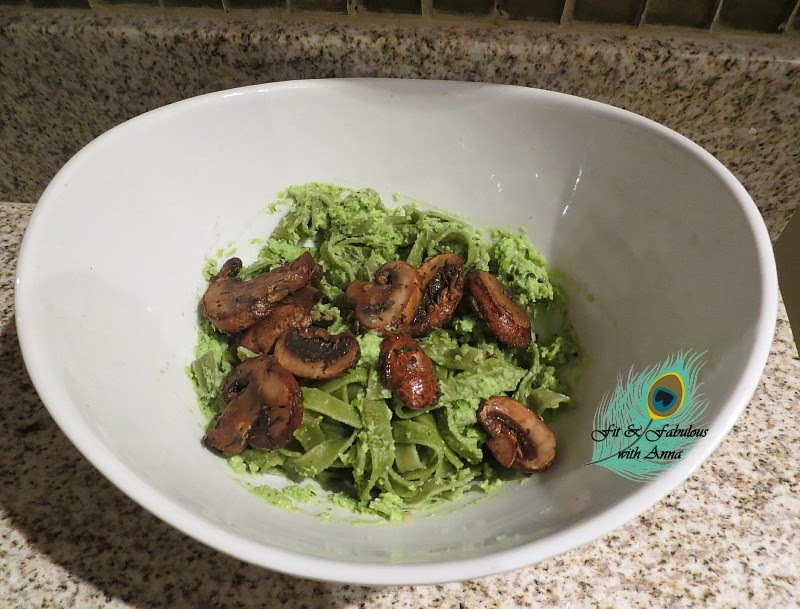 When the mushrooms have cooked down, add pasta to the pan, along with the pesto. The pesto will be relatively thick, but if it’s too thick add a few tablespoons of water.